Fragmentary Texts » Why do we quote? Drawing from anthropology, cultural history, folklore, cultural studies, sociolinguistics, literary studies and the ethnography of speaking, Ruth Finnegan’s fascinating study sets our present conventions into cross-cultural and historical perspective. 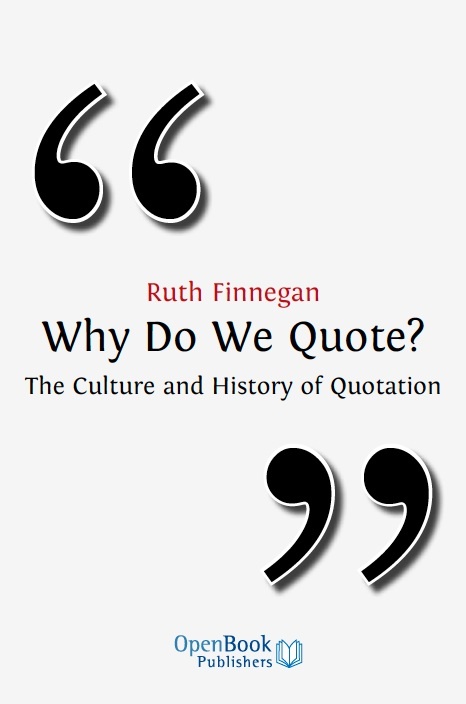 She traces the curious history of quotation marks, examines the long tradition of quotation collections with their remarkable recycling across the centuries, and explores the uses of quotation in literary, visual and oral traditions. The book tracks the changing definitions and control of quoting over the millennia and in doing so throws new light on ideas such as ‘imitation’, ‘allusion’, ‘authorship’, ‘originality’ and ‘plagiarism’.